Congratulations to Barrow Market Hall. Every year thebestof holds their national campaign to find the very best local business across the country. The winners of these awards aren’t chosen by a panel of judges or by ourselves here at thebest of Barrow and Furness – they’re chosen by you the general public in the form of feedback and reviews left for business on our bestof review cards. This year we’re pleased to announce that Barrow Market Hall claimed top spot, and on Wednesday 11th April 2018 we visited the market to present their awards. I say ‘awards’, because not only did they win Business of The Year for this area, they finished top of their category nationally and placed in the top 100 businesses throughout the country too, a really fantastic achievement. 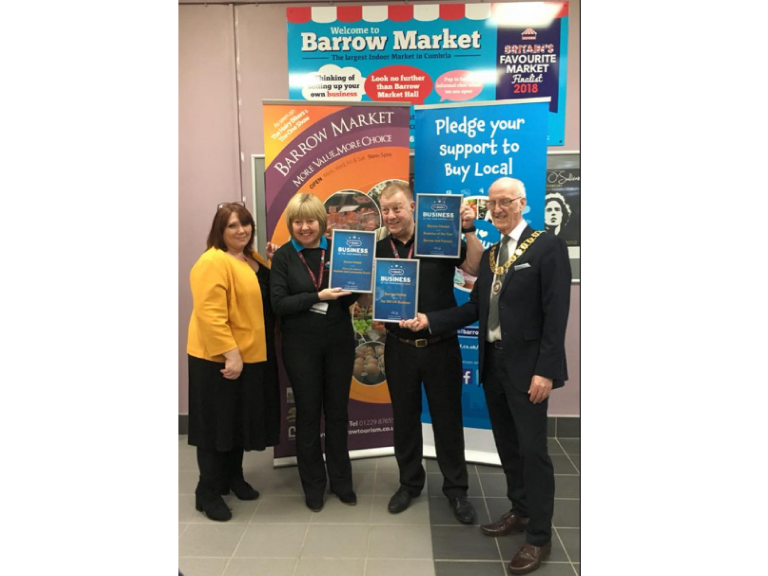 Market Hall Manager Paul Smith, Market Hall Administration Assistant Jacqui Armstrong, Barrow’s Deputy Mayor, Bill McEwan and Keith Johnson – Assistant Director for Community Services at Barrow Borough Council were all in attendance to receive the awards. It was a really proud moment for the market; speaking about the awards, Jacqui said ”We achieved this through our traders working together, delivering a positive customer service and our loyal shoppers leaving a review of our traders and the Market Hall. It wouldn’t have been possible without them. The competition for this year’s title was fierce, and the market were pushed all the way by two fantastic local businesses. We will also be catching up with our runners up Cumbria Training Centre and Henry Armer Fitness to present them with their certificates shortly. Well done, everyone. Congratulations to everyone at Barrow Market Hall. Will they be able to hold on to the title next year? We can’t wait to find out.